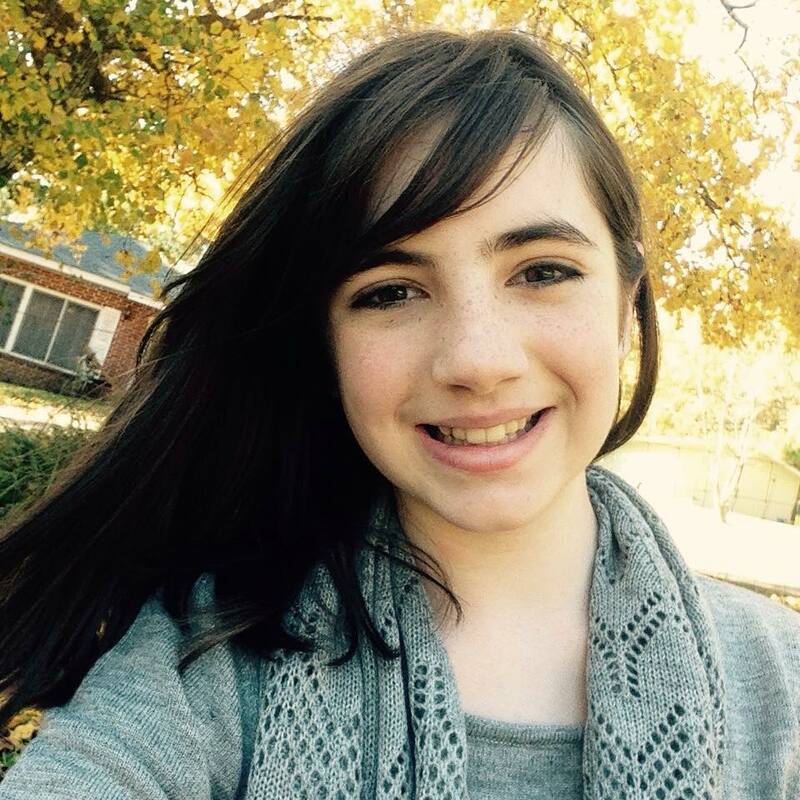 Introducing … Megan, my beautiful thirteen year old daughter. It is seriously hard for me to grapple with the fact that this super sweetheart is turning fourteen years old in just two weeks. I met Meg when she was a shy eight year old girl. A year later, I married her dad and had the blessing of adding this amazing young lady into my family, but she has had a place in my heart long before she ever became my daughter. Megan is an organized wonder. She is adept at cleaning out closets and rearranging furniture. A bundle of energy, I quickly learned that if I didn’t keep Megan busy doing the things I wanted her to do, she would keep me busy doing the things she wanted to do. This girl wakes up every morning ready to tackle the world … and she does, but thankfully in a pleasant sort of way. She kind and thoughtful and just as pretty on the inside as she is on the outside. 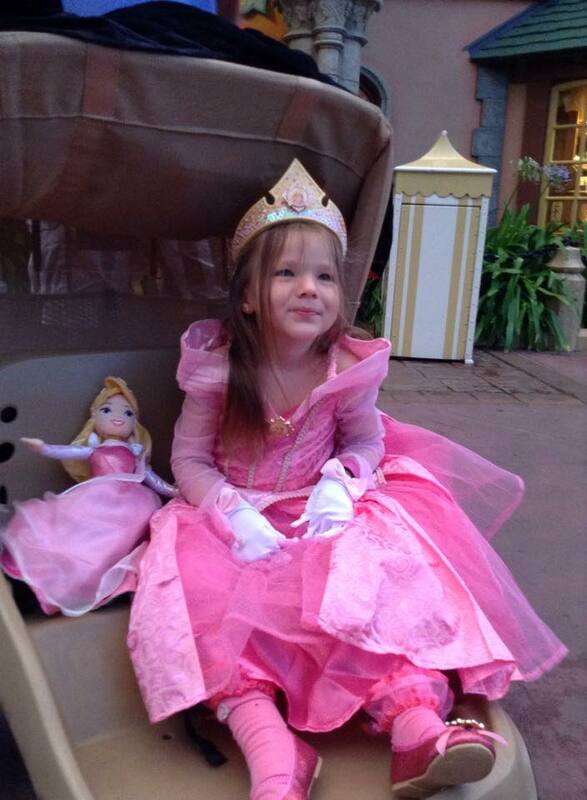 Today, I’m pleased to share Megan’s essay on a recent trip to Disney world with her mother. 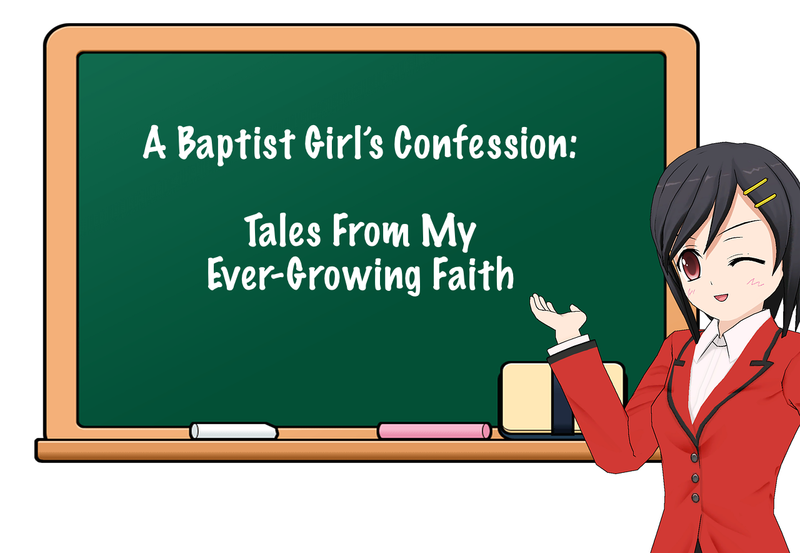 She is the last of my five children to guest post for me during the month of April. But I think you’ll find her story was well worth the wait. When I was a little girl, my favorite Disney princess was Cinderella. I thought she was the prettiest of them all, with her blonde hair and sparkly white dress and dainty glass slippers. Oh, how I wished for a fairy godmother of my own so that I could be turned into a princess, too! 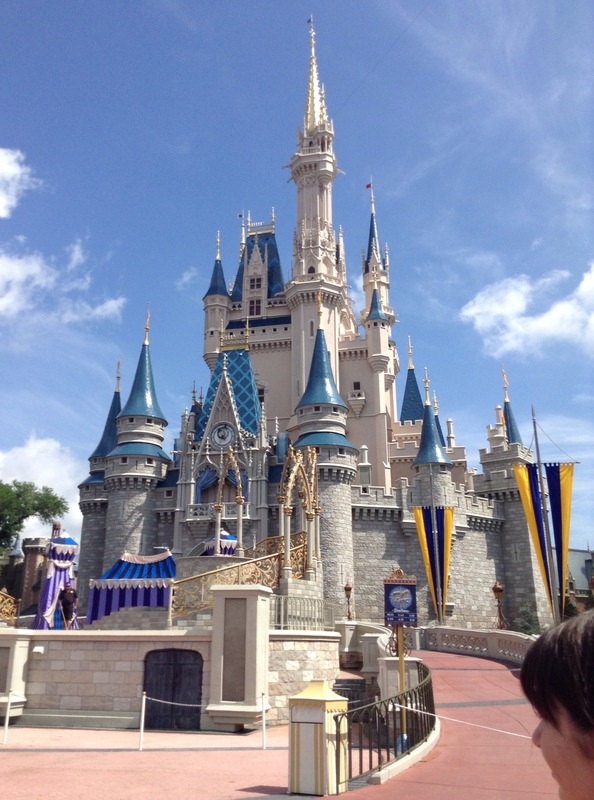 Last summer, my mother took me on a week-long vacation to the “Happiest Place on Earth” … Disney World. But I didn’t have a completely happy experience while I was there. Thankfully, it all turned out okay in the end, but for a while I was pretty miserable. From the moment I first heard we were going to Disney World, I started looking forward to the Princess Dinner at Cinderella’s Castle. My mom had already said that we would stop on our way to buy new dresses and matching jewelry to wear to this fancy feast. I chose a floor length sundress with a pair of beaded sandals to match. As I rode on the long car ride to Florida, I passed the time by planning just how to fix my hair, how to do my makeup, and which colors to paint on my fingernails and toenails. Dinner at the Castle … I could hardly wait! The Princess Dinner was going to be on our last night in the park. I just knew it was going to be an amazing end to my fabulous Disney vacation. On that last day, we woke up extra early. There was still so much to see and do before we went home, and we had to fit it all in before our Princess Dinner at the Castle. We started the day in the Animal Kingdom. My little sister Sadie want to go to a petting zoo, where we fed more animals than I could count. We also went on a water raft ride, and got completely soaked. My mom suggested we eat an early lunch, knowing that we would have a very large dinner later in the evening. Shortly after lunch, it started raining so hard that all the rides in Magic Kingdom were shut down for safety reasons. All afternoon it rained off and on, stopping long enough so that we could take one ride before the rain would start again. We spent half the afternoon standing around in the rain, trying to find someplace where we could stay partly dry. Finally the rain passed over, but it still felt very humid and wet. This was our last day, so everyone in my family agreed that it was worth it to slosh through deep puddles of water, getting our shoes and socks completely water-logged. We really wanted to ride the roller coasters and to see every little thing that we could before it was time to leave. All day, as I walked around in wet clothes and squishy shoes, I reminded myself that soon we would head back to our condo to get all dressed up for the fancy Princess Dinner. I guess because of the rain and also our desire to try to do it all, no one paid much attention to the time. Suddenly it was 6 o’clock, and we had to be at the castle by 6:30pm for our dinner reservations! In order to change clothes like we were planning, it would mean having to catch the monorail, ride over to our condo, unload and get five people dressed in nice clothes and then catch the monorail back to Cinderella’s Castle in just half an hour’s time. I couldn’t believe my ears! Not change for the fancy Princess Dinner? Was my mother serious? Surely not! Unfortunately, she was. Somehow I managed to hold my tongue. I didn’t say anything to my mother about how I felt, but on the inside I was fuming mad. To make matters worse, my stepfather decided to buy my little sister Sadie a brand new $80 princess dress to wear, so she got to change clothes and look all pretty, while the rest of us looked like a bunch of drowned rats. As I walked into the castle, with my shoes squishing with every step I took, I felt as dejected as I looked. There I was sweaty and stinky with wet, tangled hair. “I am anything but a princess,” I murmured, but I don’t think anyone heard me complain. Everywhere I turned, there were beautiful women, wearing dresses with lots of jewelry and makeup. Each time I saw another lady dressed up so fine, I remembered how I looked and hung my head in shame. I couldn’t believe my mother hadn’t let us go change clothes! This was not turning out to be the grand finale’ I had hoped it would be. While we were standing in line for our dinner, my mother wanted us to take a picture with Cinderella. That was the last thing I wanted to do! 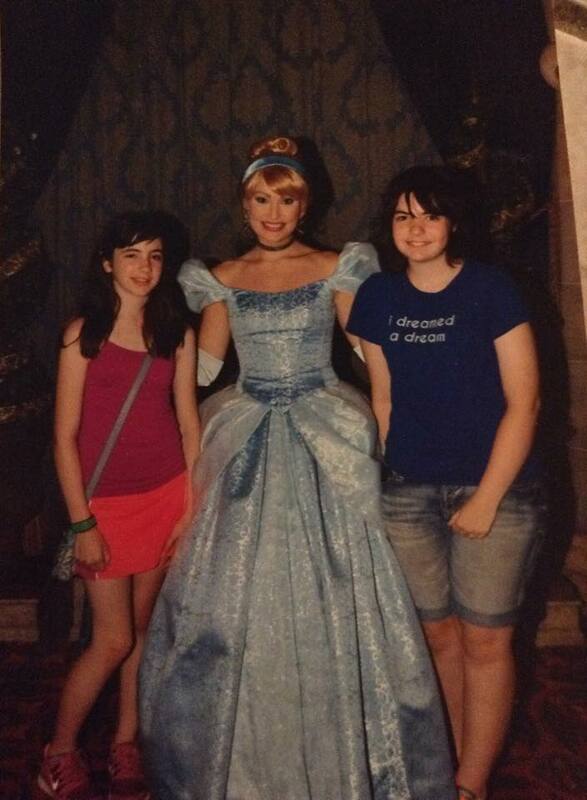 There I was, looking like a piece of trash, next to the beautiful Cinderella. I faked a smile and as soon as the picture was taken I rushed back to my spot in line. Finally, after a tremendously long wait, we were led to our table. As we approached out place, I could hardly believe it. We had gotten a table right next to the big glass windows, the most perfect spot for viewing the fireworks. For a few minutes I forgot all about my ragged appearance, but then something else happened to make me remember. While we ate, each of the princesses came over to our table to take photos and sign our autograph books. Of course, my mom wanted me to get in every picture. I tried to look happy, but as I posed next to each beautiful princess all I really wanted to do was slouch a little lower in my chair. I wish I could say that my attitude changed that night, but it really didn’t. However, eventually I did stop focusing my thoughts on my appearance and began to enjoy the actual experience of eating a nice meal with my family and watching fireworks from Cinderella’s Castle. Later, however, as I began to look back over my experiences and memories from my week at Disney World, I started to think differently about that princess dinner. When I was a little girl, I thought being a princess was all about having the right look. All the Disney princesses wore gorgeous dresses and had lots of jewels. Their hair was perfect. Of course, their Prince Charming was as dashing as they were beautiful. To my childish way of thinking, beauty was all about the outward appearance. I thought about this for a long while. I don’t think this means that beautiful clothes or wearing jewelry is wrong. However, it is important for me to remember that these are not the things that will make me beautiful girl. Instead, having qualities such as a gentle spirit, loving attitude, compassionate heart, an inner joy and a peaceful disposition will bring out my true beauty. The best thing is that them more I pondered those fancy Disney princesses, the more I realized that each one displays at least one quality of inner beauty, too. For example, Cinderella is so kind and loving. She beams with an inner joy, despite her circumstances. Snow White has a gentle spirit and a compassionate heart. And Sleeping Beauty has such a peaceful personality. Even without their fancy dresses and elaborate jewels, they are beautiful … beautiful on the inside. I may not be a fancy princess who lives in a castle, wears puffy dresses and has a handsome Prince Charming. But I can have the heart of a princess just by choosing to be the kind of person who strives to have those special qualities that sets a girl apart. And I’m grateful that real beauty always comes from the inside out. I agree, completely! Megan has a lot of godly insights and I am blessed by her honesty. Thank you my dear Paige for helping Meg to blossom into the young girl she is today. God gets the glory as he shines in you! Beautifully written, and what a valuable lesson! Perfect dinners are nice, but what you gained that evening is priceless! Thank you for sharing Meg’s post and kudos to ALL Meg’s parents for a job well-done. so glad you visited my blog and commented! Meg says thanks, too! Inner beauty really gets tested when it has to compete with disappointment, frustration and a bunch of other not so good feelings. Megan, glad you look back on it all with wisdom. That’s exactly what God wants us to get from experiences like that. Paige, thanks for including your children, and for giving them another venue for encouragement in their writing. .